The foot is considered by many to be the most ignoble part of the body. It trudges heavily in the dust of the earth. Because of its distance from the hands, it is the hardest to clean. Its sole purpose is to take us from one place to another. Unlike the hand that creates and sculpts, or the tongue that sings and praises, or the eyes that see the wonders of the world, or the ear that hears the birds sing, the foot is our beast of burden. It takes us where we want to go. To wash another’s foot, their lowliest part of the body, is to show that person that you hold them in higher regard than yourself. 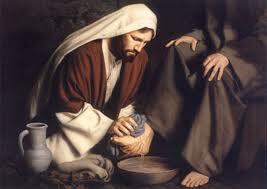 What is Jesus telling us, by washing His Disciples feet? This is not what we would call grand-standing. If we know Jesus, nothing He does is just for show. A message is being sent to them… and to us. If He is willing to wash our feet, to suffer and die for us, how are we to regard each other? Who among us is greater than Jesus? Later on in the chapter, Jesus tells them that He has given them a new commandment; they are to love one another as He has loved them. The last Supper was truly a most memorable event. We are told to treat others with love and respect. We are told to love them as Jesus loves us. It is demonstrated to us to what lengths we should be willing to go for others, even to the extent of washing their feet. This is to let us realize that we cannot put on airs. We cannot look down on anyone, even those that have (in our opinion) made a mess of their lives. Again, we hear Christ’s words admonishing us that he, who is without sin, cast the first stone. When will we get it? When will we understand that all of us are struggling, all of us have problems or pasts of which we are ashamed. We don’t want anyone to know how ugly we can be, how ugly we have been. Instead, we do everything in our power to appear “normal”, to have people look up to us. Beware of pride. It has taken down many before us. It is so subtle we don’t even realize that it has taken hold of us. The people that we meet and greet are struggling like us. Don’t look at their clothes. Don’t be judgmental. Don’t wonder about their cleanliness. Look at their eyes. Their eyes are the windows to their soul. They are people, as lonely, as confused, as hurting as you. They are trying, like you, to understand where their lives are going, where it all fits in. Love them. Be kind to them. We are to love them, all of them, as Jesus has loved us.